Why liquefy hydrogen? Why IDEALHY? 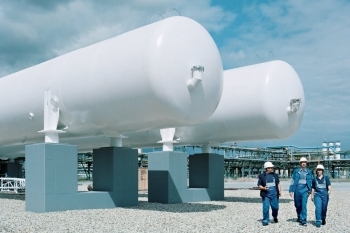 Hydrogen is an excellent energy carrier with respect to weight. 1 kg of hydrogen contains 33.33 kWh of usable energy, whereas petrol and diesel only hold about 12 kWh/kg (see www.h2data.de). In terms of volumetric energy density however, hydrogen is outperformed by liquid fuels. This poses a challenge when hydrogen must be transported from the place of its generation to a refuelling station. Petrol and diesel carry around 8.8 and 10 kWh/litre, respectively. Under ambient conditions, a cubic metre of hydrogen provides some 3 kWh, equivalent to 0.003 kWh per litre. Pressurised hydrogen contains about 0.5 kWh/litre at 200 bar, 1.1 kWh/litre at 500 bar and 1.4 kWh/litre at 700 bar. The best way of transporting hydrogen in terms of energy density is liquid hydrogen, achieving more than 2.3 kWh/litre. The drawback of hydrogen liquefaction is the amount of energy involved. This is partly due to the very low temperatures required to condense into its liquid state (about -253°C). State of the art hydrogen liquefaction technology has a power consumption of 12 kWh/kg. This is equivalent to 36% of the useable energy contained in 1 kg of hydrogen (33.33 kWh/kg, see above). It was a key aim of the IDEALHY project to identify and develop a process design that can roughly halve the specific power consumption for hydrogen liquefaction, i.e. reduce it to about 6 kWh/kg. In fact, based on technology analysis, conceptual work and process optimisation, 6.4 kWh/kg were accomplished. There is potential for further reducing specific power consumption, pending tests of appropriate components, such as turbo machinery, and operation of a demonstration plant. Details with respect to results and follow-up activities can be found in the Publications section.